Zachary Fine and Elijah Alexander in FRANKENSTEIN — PLAYING WITH FIRE. Photo by Dan Norman. The Guthrie is reviving Frankenstein — Playing With Fire, staging Barbara Field’s excellent drama. They premiered the show back in 1988 and it’s easy to see why they decided to bring it back to life. Field’s play is both moving and intellectually stimulating anchored by an excellent cast under the firm direction of Rob Melrose. This is not the story we are accustomed to. 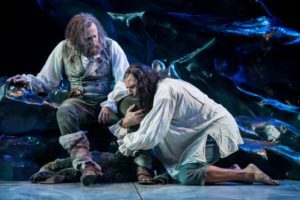 Field’s play leaps ahead in time to an aging Frankenstein (Zachery Fine) who has chased his Creature (Elijah Alexander) to the arctic in order to collect some final data before murdering him in revenge. Ever the scientist, Frankenstein takes furious notes. “Do you dream?” is his first question to the Creature. Frankenstein—Playing with Fire is not about “how” or “what.” It is about “Why?” Frankenstein is a scholar, a product of the Enlightenment, who believes in reason and facts. He creates a man of passion, a Romantic, who searches for answers about which there is no empirical data. This Creature howls at the moon. He teaches himself to read and memorizes Milton’s Paradise Lost. If this sounds stilted it is not. As the two confront each other, they are supported by versions of their younger selves: excellent Ryan Colbert as Victor, the young Frankenstein, and equally excellent Jason Rojas as Adam, his creation. In a way these two local actors have the more difficult roles as they assume serious identities of characters we all know of from Hollywood’s more melodramatic roles. Director Melrose uses every part of the thrust stage as actors, prowl, creep, glide, climb and dance across and over the set (Jonathan Beller, movement director). The set by Michael Locher is as provocative and multilayered as the play’s dialogue. It features a towering rock formation and an antiseptic lighted archway. Cat Tate Starmer’s lighting design is striking, aiding the action on stage with eerie effects. Early in the play the decrepit Frankenstein asks the Creature, “Do you understand irony?” One of the strengths of Field’s play is that it uses all the ironies available to it in the original text to make a play that is topical now. Frankenstein answers his own question by saying “How could you, you lack context.” This play provides fascinating context.